One of the most anticipated Westerns in well over a decade is coming to a movie screen near you. Winner of the coveted Golden Lion Award for best picture at this year’s Venice Film Festival, Brokeback Mountain , is due out in mid-December. Brokeback Mountain is garnering critical praise and expected to be a strong contender come Oscar time. This isn’t surprising, really. The film’s budget, at $13 million, is modest by Hollywood standards, but it boasts an impressive pedigree. Based on a short story by Pulitzer prize-winning novelist Annie Proulx that first appeared in The New Yorker , Brokeback Mountain is co-scripted by another Pulitzer prize-winner, Larry McMurtry, directed by Academy Award-winning director Ang Lee ( Crouching Tiger, Hidden Dragon ), and produced by Focus Features, the studio responsible for such award winning films as The Pianist, Lost in Translation , and Eternal Sunshine of the Spotless Mind. A modern-day Western, Brokeback Mountain chronicles a 20-year ill-fated romance set against the magnificence of the arid ladscape of the American West. The premise isn’t new—cowboy heroes are rarely destined for the stability of hearth and home. But there is a notable difference: the lovers in this Western are two men. At first glance, we might think liberal Hollywood has run amok again, giving us yet another example of deviant popular culture bastardizing a cherished genre. But Brokeback Mountain is actually in keeping with a strong tradition. Westerns, we forget, particularly in their heyday from the 1950s through the early 1970s, often explored controversial social issues. In fact, many of the films that questioned the validity of longstanding beliefs throughout that period were Westerns. After all, who would ever suspect that such a simple and fundamentally American genre could entertain oppositional views? In 1950, Hollywood icon Jimmy Stewart starred in Broken Arrow , one of the first major motion pictures not only to tell a story from the Indian point of view, but to challenge the taboo against inter-racial marriage, which was still illegal in some states until struck down by the Supreme Court in 1967. High Noon (1952), featuring Gary Cooper as a marshal who must face four killers on his own, was scripted by Carl Foreman who was blacklisted by the time the film was released. He wrote High Noon knowing he would be called before the House Un-American Activities Committee and used the Western as a metaphor for his own experience of persecution and increasing isolation under McCarthy-era paranoia. The final moment, when Gary Cooper throws his badge in the dirt at his feet, prompted John Wayne to call High Noon the most un-American thing he had ever seen. This trend accelerated in the 1960s and 1970s as a disillusioned America produced antiheroes battling an increasingly corrupt society where the line between good and evil was ambiguous and blurred. As Burt Lancaster says in The Professionals (1966), “It’s the good guys against the bad guys. Question is, who are the good guys?” The Wild Bunch (1969), with its climactic bloodbath, gave us a world where the only men with a code of honor were bank robbers, killers and mercenaries. Little Big Man (1970) and particularly Soldier Blue (1970) offered clear metaphors for the Vietnam War, showing that massacres like the one that happened at My Lai in 1968 were not new to U.S. history. Brokeback Mountain , the “gay Western,” as it is being called, is very much within this tradition. Gay rights is at the center of socio-cultural debate today. There is more acceptance of gays and lesbians than ever before but also vituperative reaction against that acceptance. Not surprisingly, we’re seeing this played out in our popular culture. Gay characters and personalities have been common on television since Ellen DeGeneres came out in 1997. We see recurring gay characters on such diverse shows as NBCs Will and Grace , HBOs Six Feet Under , and the irrepressible Fab 5 of Queer Eye for the Straight Guy . to learn more. Copyright Yardena Rand. 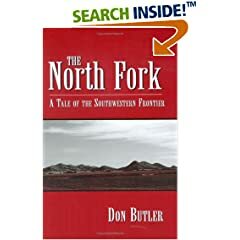 The North Fork spans the turbulent decades on the southwestern frontier following the Civil War, telling the overlapping stories of people from three different cultures, struggling to survive while too often pitted against each other by circumstances beyond their control. After the war, control of the land known as Comancheria--all of the South Plains, including half of both Texas and Indian Territory--is wrested from the Comanches and Kiowas, opening the way for cattle drives and giant Texas cattle companies. Eventually, the settlers come, hungry for land and seeking a new life. Molly Harding, a Texas farm girl, caught in the conflict between her head and her heart--and in the middle of a thirty-year-old mystery. Indian raids and uprisings, the destruction of the buffalo herds, creation of the reservations, the Buffalo War, cattle drives, the Red River boundary dispute, the creation of Oklahoma Territory, arrival of the homesteaders, and other historic events shape the destinies of the people along the North Fork--a place where their cultures will clash while their personal lives become entangled in ways they could have never imagined. The North Fork is set in the place of the author's youth. After retiring from the practice of public utility and municipal law, Don Butler turned to historical writing and research. He and his wife live in Austin, where he once served as City Attorney.